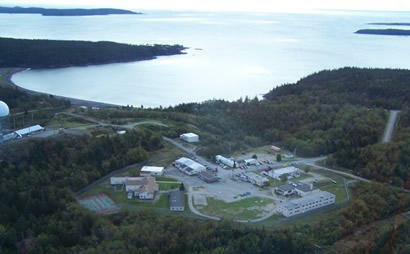 For now, the Downeast Correctional Facility continues to operate with five guards and eight inmates. But unless the Legislature votes to fund the facility with veto-proof margins, it will shut down for good on June 30, when the state's fiscal year ends. On Tuesday, House Republican Leader Ken Fredette was among those who voted against continued funding for the prison. "I don't think anybody really sees the Downeast Correctional Facility as having a long-term future," he says. That includes Gov. Paul LePage, whose pre-dawn closure of the facility in February violated state law. Earlier this month, Justice Michaela Murphy sided with attorneys representing about 50 DCF staff laid off by the Department of Corrections, and ordered that the prison be kept operational until the Legislature decides otherwise. But the 60-plus inmates who were part of work release programs that benefited area businesses in Washington County have since been transferred to other facilities. Fredette says LePage could still support limited funding for DCF - if lawmakers authorize a pre-release center in Washington County. And that bill, he says, remains stalled in committee. "Now, we simply need some legislative action authorizing for something to be built - that's this other bill that's now out there about this new pre-release center down in Washington County," Fredette says. "For some reason, it hasn't been moved out of the Criminal Justice Committee - which is part of the problem." Some Republicans say majority Democrats in the House are purposely holding hostage the pre-release center bill as a way to leverage DCF funding. The bill would keep the facility open for a year while lawmakers study the implications of the closure on the corrections system and Washington County's economy. Lawmakers voted Wednesday to fund the facility, but by a margin that fell short of the two-thirds threshold needed to override a likely LePage veto. Fredette says if members of the House and Senate would simply approve the pre-release center bill, then he and other Republicans - including LePage - would support the limited operation of DCF until the pre-release center becomes operational. But Fredette says House members have taken the opposite approach. "To do it the other way around is not going to get the support of the House Republican caucus; that bill will get vetoed and probably sustained," he says. "We're not ready to make a deal," says Sen. Joyce Maker, a Republican from Calais. "We hope to get it to Appropriations and we'll work with Appropriations and the Democrats and Republicans and see what we can do for the best for Washington County." Maker has been leading the fight in the Senate to preserve funding for DCF in order to complete a review on the planned closure's cost-effectiveness - both to the Department of Corrections and to the Machias-area regional economy that has employed many of the inmates over the years. Maker is supported by GOP Rep. William Tuell, of Machiasport, who says that in a worst-case scenario, there is voter-approved bond money available to move forward with the pre-release center - although it was originally earmarked for the state correctional facility in Windham. "Use that money to refurbish, upgrade, rebuild, replan, do whatever for the future - that money's there, it's not going away," Tuell says. The money may not be going anywhere, but the lawmakers in the 128th Legislature will be. Democratic House Speaker Sara Gideon says she remains committed to finding a funding mechanism to restore staff positions at DCF and to repopulate it with prisoners. But she also says many House Republicans continue to oppose funding as the Legislature's April 18 adjournment date looms. She's also leery of promises about what the governor will or won't do in reaction to a legislative vote. "Time is running out here," Gideon says. "I don't even know if I would call what Rep. Fredette has said to you as a real proposal." While legislative efforts to save the prison continue, arguments over whether Gov. LePage is fully complying with the court order granting injunctive relief are playing out in Superior Court, where attorneys for the displaced workers are claiming that the prison cannot be considered operational with only five workers. This story was originally published March 29, 2018 at 4:40 p.m. ET.